Not a high tech gadget at all - something very simple - Blackspur Magnetic Wrist Band Strap Holder for Screws and Nails etc is designed to hold screws and nuts and bolts so you can have both hands free for using the drill or climbing the ladder. 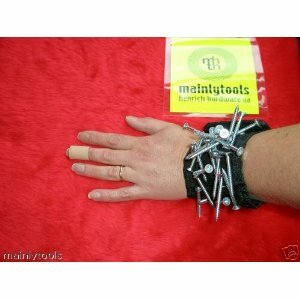 For those times when you don't have an assistant to pass you up screws or nails. Very useful little bit of kit and a real stocking filler price! Velcro fastening wrist strap is adjustable so suitable for everyone. Perfect for anyone who likes doing DIY and always asks for help when they have both hands full! Will help you be more productive and make less trips up and down the ladder, or get on with things faster. Easier than having screws or nails in a pocket too! You can see how many you've got out so you know you've got enough to finish the job. And take a long look at the photo. Is it just me who finds it's amusing he's got a plaster on! Great little gift idea for the keen DIYer. Very unique, in the simple kind of way..Sometimes, the simplest things can be the solution..I got this product, just recently, and I can't still phantom how a very simple (and common) idea could be the solution to my problem. However, it does have some glitch, especially when I'm using nails. There are times when I graze myself because my skin always gets in contact with the pointed end of the nails. But aside from that, I have no complaints about this product.